Click here to download our Call Accounting brochure (PDF). Click here to download our TollGuard circular (PDF). VoiceGates Call Accounting / Management System. You need accurate timely information on what type of traffic is flowing through your communications system, and its related cost to your organization. No more guessing . Get detailed easy to use reports, using the filters you set to alert you of toll fraud detection, system alarms, telephone system malfunction, traffic flow inefficiencies, on-hold times, costs, profits, bill backs, and even employee productivity. VoiceGate puts control in your hands. Now you can use Toll Guard to increase your bottom line and increase customer satisfaction, in a feature rich, power packed cost control system. VoiceGates award winning design team has developed an easy to use interface packed withadvanced features . Create hundreds of simple or very sophisticated reports is a snap. Effortless report generation minimizes costly administration time. No more dedicated PC to run your voice and data management system. Toll Guard can work alone or share the PC with your VoiceGate Integrated Communications Server (ICS) call processing system. 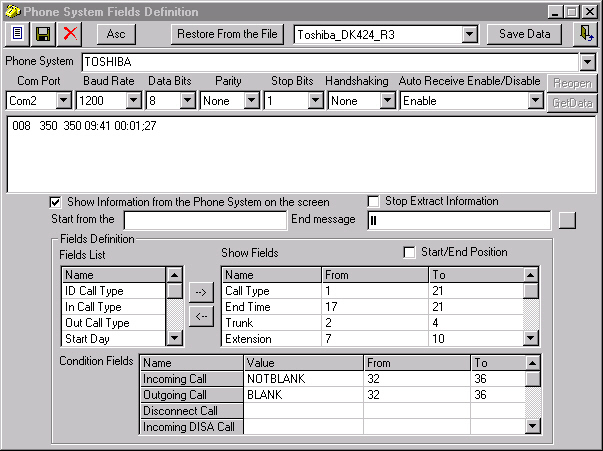 When combined with the VoiceGate ICS , you need not set up users on the call accounting interface. You simply import the users set up on your VoiceGate voice mail platform, enter your telephone rates and set up your alarms, connect to the SMDR port and your system is ready to go. Your call accounting system will automatically log all in-bound and out-bound caller or departmental calling activity; calculate long distance charges, surcharges, costs and profits putting you in total control over your telephone expenses. Doctors, lawyers, engineering firms, or any professional services group can now allocate costs to individual accounts, projects, or clients. Simply key in the account code on your touch tone phone after you make or receive a call. VoiceGate takes care of the rest. It uses the code entered and allocates all costs to that particular account for charge back at a later date. VoiceGates call accounting streamlines invoice management by reducing costs associated with generating accurate, detailed billing statements. Hotels, Motels, Health Care Institutions or Alternate Long Distance Carriers need to know not only what their call costs are, they also need to be able to add a profit margin on each called area. This facilitates quick calculation and accurate tracking of the revenue these facilities are generating on their call traffic. Telephone lines are expensive. Not only are the on-going monthly costs for each trunk prohibitive, the trunk line card capitalization on your phone system can be a source of a huge revenue drain. Toll Guard call accounting/cost management system allows IT managers to monitor trunk activity for peaks and troughs in usage by running a thorough traffic analysis. Save thousands of dollars by effectively deploying or eliminating underutilized personnel and IT resources. Identify problem areas or calling times and minimize their impact on your personnel and customers before they get out of control. IT managers can optimize trunk lines, system infrastructure and personnel resources by determining calling patterns and eliminate over or under capacities in any of these areas. The ability to optimize system resources creates happier customers as their calls can now be handled more effectively and promptly. Business communications equipment is a large portion of your IT budget. Now you can allocate not only the cost of the equipment to individuals, departments, divisions or projects, you can also allocate the costs incurred on telephone line charges. Toll Guard allows businesses to protect themselves from long distance and personnel call abuse. Parameters can be set to alert managers when certain numbers or area codes have been dialed, calls over a certain duration, specific digits such as 911, and a host of other events that may need to be monitored. Employees knowing that you have the capability to monitor calls from individual extensions or departments and the associated costs with their misuse of your phone system will curtail their fraudulent activities. The ability to tighten security saves you money and increases employee productivity. 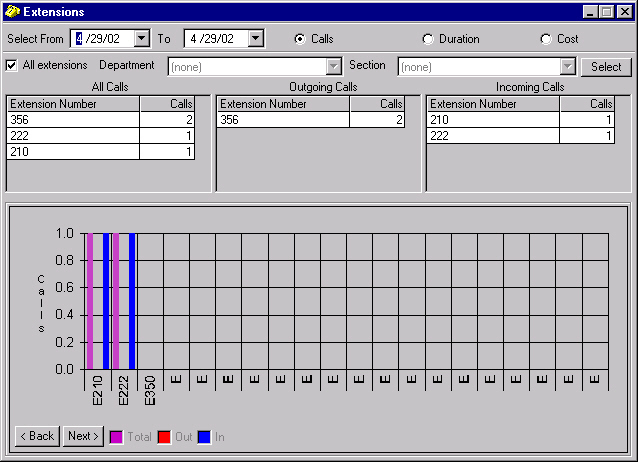 Employees can be given targets for the number or duration of calls. This data is readily available by department or by extension and helps them monitor their activity to achieve higher levels of success. Increase the security of your phone system using some of the many alarms the system allows you to create. Once the system detects activity for which an alarm has been configured, it can send an e-mail notification alerting you there has been an alarm triggered on your system. VoiceGate also allows Toll Guard to send a text to speech message to any mailbox (es) on the VoiceGate ICS voice mail system*. From there, you can set rules for notification within your mailbox. The system can call you at home, pager or on your cell phone. It even can hunt up to 5 different numbers until it successfully delivers the alarm message. Voice Mail notification of call accounting alarms is a VoiceGate exclusive. The system can also be programmed to alert management when the telephone system is suspected to be off-line and / or incapable of receiving calls. This alarm allows for quick response to a potentially catastrophic situation. Toll Guard takes advantage of its network or dial up capabilities and delivers daily reports to any e-mail account. Management or Administrators never need to leave their desks to receive or pick up reports that are generated automatically on a daily basis. 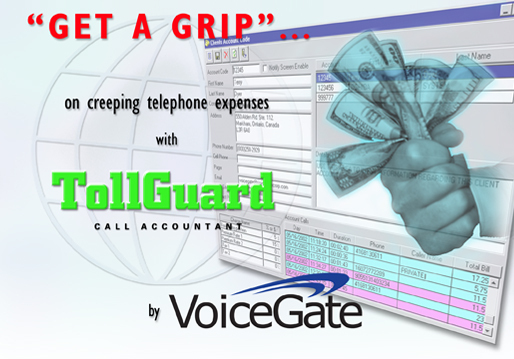 One more example of how VoiceGates Toll Guard call accounting / management system delivers high performance and ease of operation. Call 1-800-668-2387 say "sales" to our Speech Enabled ICS and get more information on this exciting, affordable new product.